The dramatic coast of British Columbia with its forested landscape and looming mountains, and the waters of Vancouver Island are Orca Whale central. It's captivating to experience the orca whales quietly cruising through the frigid waters of Johnstone Strait, while backdropped by the towering peaks of the British Columbia Coast mountains. The mountains and landscape are wrapped in lush coastal forest, which gives way to the rocky snow-covered peaks at a higher altitude. Killer Whales off Northern Vancouver Island, British Columbia, Canada. 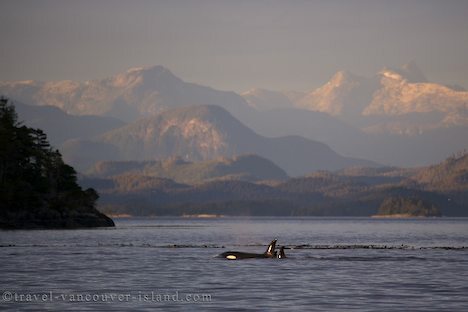 Picture of two Orca whales off coast of Vancouver Island with the landscape of the BC mountains as a backdrop.